Rusty crayfish are small crustaceans with long antennae, two pincer claws, and eight legs. They grow up to five inches long and their body color varies from light to dark brown. A pair of rust colored spots may be found on either side of the carapace (hard upper shell), and the claws often have black bands at the tips. When the claws close, there is an oval-shaped gap. Young, small crayfish can be difficult for non-specialists to conclusively identify. Rusty crayfish are omnivores, consuming many food sources such as plants, animals, organic material, sediment, etc. They prefer areas with rocks, logs, or other debris for shelter. Males and females mate in late summer, early fall, or early spring. Females can lay between 80 and 575 eggs. Eggs hatch in three to six weeks, depending on water temperature. The young stay with the female for several weeks after hatching. Their expected lifespan is three to four years. Rusty crayfish are native to the United States’ Ohio River Basin. They were likely introduced and spread through the improper use and disposal of live bait. The species is also commonly imported and sold by the aquarium trade, and to schools by biological supply houses, leading to the potential for illegal release into the wild. The first established population in Minnesota was in Lake Superior in the late 1990s. Refer to EDDMapS Midwest for distribution information. Rusty crayfish (Orconectes rusticus) is a regulated invasive species in Minnesota, which means it is legal to possess, sell, buy, and transport, but it may not be introduced into a free-living state, such as being released or planted in public waters. Licensed anglers may collect any crayfish for use as bait on the same water body. They can also harvest up to 25 pounds of any crayfish for personal consumption. A person wishing to take or possess more than 25 pounds of live, whole, freshwater crayfish must first obtain a permit. Selling live crayfish for bait or aquarium use is illegal. See crayfish harvesting for more details. Invasive species cause recreational, economic, and ecological damage—changing how residents and visitors use and enjoy Minnesota waters. Destruction of aquatic plant beds. Aggressive displacement of native crayfish species. Breeds with native crayfish, replacing native crayfish populations with hybrids. Compete with fishes for prey, and consumes fish eggs. People spread rusty crayfish primarily by illegal release of aquarium pets and improper use and disposal of live bait. It is illegal to release or dispose of unwanted aquatic plants or animals in or near public waters. Refer to Habitattitude for alternatives to release. 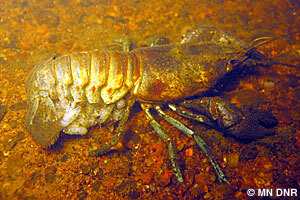 A single mature female carrying viable sperm or young crayfish can create a new infestation. Report new occurrences of rusty crayfish to the DNR immediately by contacting your DNR Invasive Species Specialist or log in and submit a report through EDDMapS Midwest. There is no known population control for rusty crayfish in natural water bodies at this time. Trapping may reduce numbers, but would likely not have a significant impact on the population. Increasing fish predator numbers, either through regulation and/or stocking, has shown potential for reducing crayfish populations.